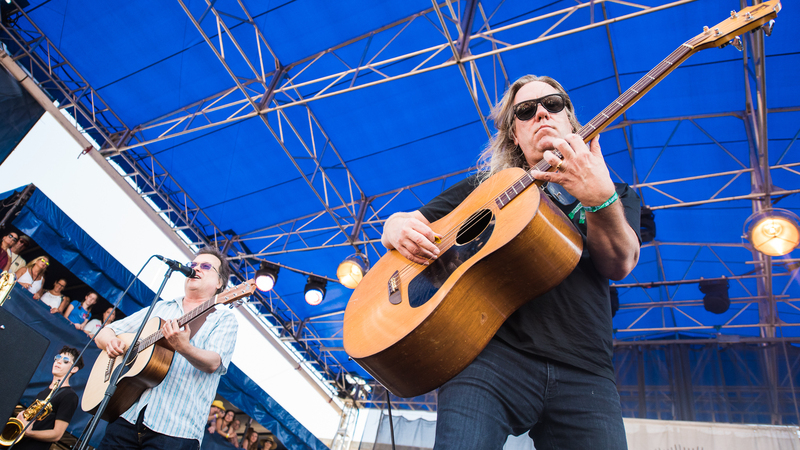 Even though Violent Femmes played the Newport Folk Festival midway through a bright summer afternoon, the rock band's new song "I Could Be Anything" made the sunny field feel like a packed pub, where beer has made everyone friends, and revelers bellow out drinking songs with arms thrown across shoulders. The off-again, on-again veterans from Milwaukee, who recently released their first studio album in 16 years, threaded their Newport Folk set with wildly diverse songs from their catalog of 30-plus years. Original members Gordon Gano and Brian Ritchie led the band's careening, playful ride through a smattering of polka, blues and acoustic tunes, with Gano shifting from snot-nosed punk to earnest believer on folk-gospel songs like "Jesus Walking On The Water." But (obviously) it was mainstay songs like the off-the-wall hit "Blister In The Sun," crowd favorite "Add It Up" and the xylophone-driven "Gone Daddy Gone" that bonded old and new fans together like a friendly round of lagers.